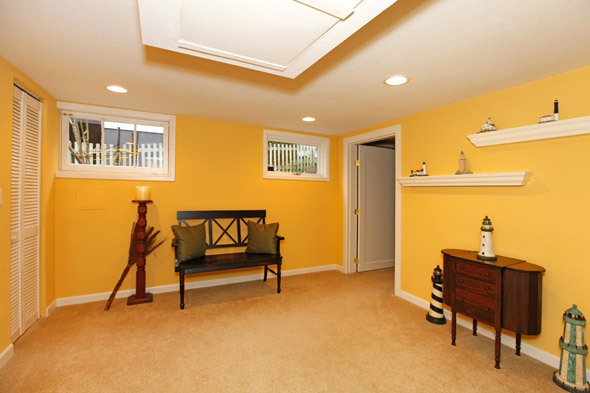 When it comes to basement flooring ideas, a subfloor is a necessity, not an option. But why do you need a basement subfloor system? Basement concrete floors, because they are built right on top of the soil, are cold and damp. Warm, moist interior air, particularly when the relative humidity is higher than 50%, will always condense onto cold surfaces, such as single-glazed window glass, uninsulated foundation walls and bare concrete floors. The basement subfloor system should prevent moisture from condensing onto the concrete surface because it blocks cold conduction through the concrete floor slab. Concrete floors are porous and hydrostatic water pressure will cause water to migrate through the slab and onto the basement floor. Sometimes during power outages, sump pumps fail or foundations will leak due to extreme weather conditions. The basement subfloor system should have an air space to allow water to flow away to a floor drain or to evaporate naturally with air change in the room. An uninsulated basement concrete floor can account for up to 3% of a home’s energy loss. Finished floors on top of concrete are typically very cold in wintertime, and not a good basement flooring idea. A basement subfloor system should provide adequate insulation to help prevent excessive heat loss and provide a warm comfortable walking surface. Installing finished floors directly to the hard unforgiving concrete floor results in floors that are rigid and uncomfortable, and in the case of hard surface floors, make a hollow-sounding “clacking” noise. A basement subfloor system should provide a solid, stable surface for a finished floor that is quiet, contours to the uneven concrete surface and provides a cushioned “spring” feel.